or that special you-know-who. Get creative! Such a neat photo. I’m not a huge fan of tomatoes (or strawberries. I know: I’m strange). But hubby loves nothing better than a “damata sandwich”! You say “damata”, I say Tomato. 🙂 You are like my husband Dianna – he hates cheese. Imagine? If this isn’t a PERFECT image of summer, I don’t know what is. 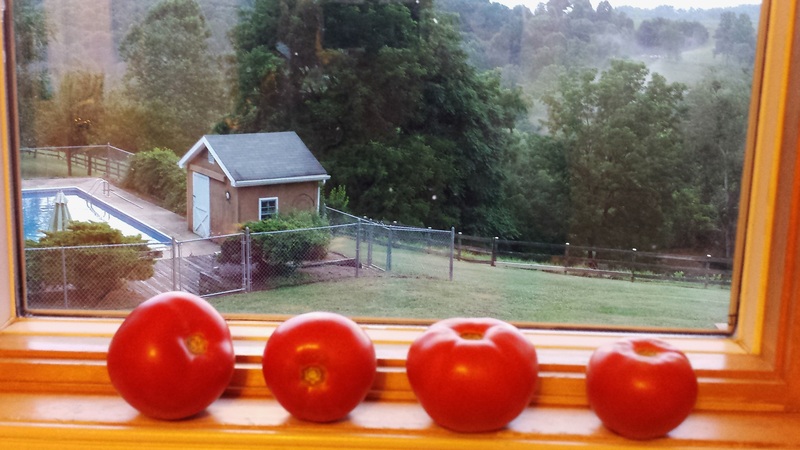 Tomatoes ripening on a windowsill overlooking a pool. Just right! And we love tomato sandwiches in this house!! Yep fresh picked tomatoes work for me! Nothing say “summer” more to me than fresh veggies on the windowsill. Love the pool, love the tomatoes. Thanks for sharing. Beautiful photo, Dor! Those are some fine looking tomatoes! There’s nothing better than a tomato fresh from the garden. wow 🙂 well i clicked like cuz i like the shot, if i ate one of them thingz i’d get real sick, though lol. I can almost smell ripe tomatoes. We won’t see any here until the end of August. If that, this year. I only wish – they look delicious. If we grew tomato’s the squirrels, rabbits, possums and birds would all thank us for feeding them! Your tomato’s look delicious, I can almost smell them!